At Bean Blossom 1967, photo by Jim Peva. Click for full version. 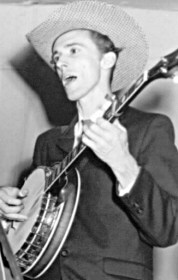 As a Blue Grass Boy: Lamar Grier was offered a job by Bill Monroe just prior to Carlton Haney's first bluegrass festival, in 1965. He didn't make a decision immediately, but played at the historic festival and a short tour in Ohio before deciding to sign on. He stayed for nearly two years and was part of one of the most celebrated Blue Grass Boy lineups, along with Peter Rowan, Richard Greene, and James Monroe. He was part of Monroe's first overseas tour in 1966 and appeared on the album "Blue Grass Time". Before and After: After leaving Monroe, Lamar Grier played and recorded with Hazel and Alice and with Peter Rowan and Tex Logan. In the 1970s he was a member of Buzz Busby's band and recorded several albums with him. He retired from music in 1984.